Jewelry is the most obvious, and the easiest, way to dress up basic garments. If you look around at some of the less “expected” stores, you can find things that you’ve never before seen – nobody at your event will be wearing an identical item! These items can easily be worn with a number of different Starting From Scratch Capsule Wardrobes, and many of these pieces could be used during the day, as well. And don’t forget that the Starting From Scratch Wardrobes already had quite a few pieces of jewelry in them – many of those pieces are well-suited for evening wear, just as many of the pieces shown below could be worn during the day. I’ve opted to include brooches instead of necklaces, just because brooches are so doggone UNCOMMON. If you’re wearing a brooch, you might very well be the only person in the room wearing one. And they’re really easy to wear – once they’re pinned in place, you can forget about them! And let’s bear in mind that part of getting dressed up is to FEEL more dressy. I find that an earring with any sort of size or movement completely changes the way I feel when I move my head. I’m aware of my earrings in a way that never happens during a normal work day, and that awareness translates into an overall sense of occasion. And the ultimate goal, really, is for you to feel festive and in the mood for a party; if you appearance is a bit more suited to the event, all the better! Just a touch of gold, and a bit of the translucent beauty of smoky quartz! 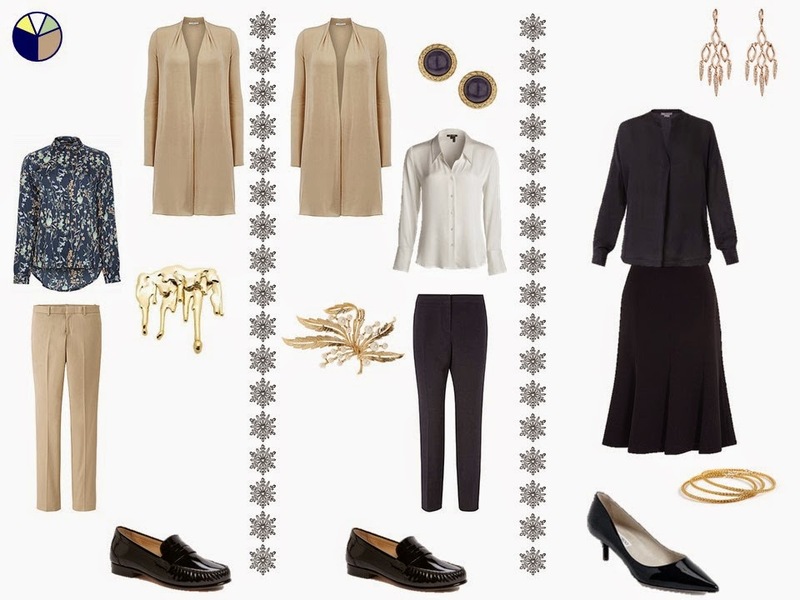 The feldspar in the second pair of earrings complements the beige in your wardrobe perfectly. A single brooch, in a memorable design, is often all you need. But the power of an earring with a bit of movement shouldn’t be discounted, either! Many of these pieces of jewelry were already in this wardrobe – but sparkly hoops, or dangly ones, or a simple hoop with a stone pendant – who could resist? Smoky quartz is also a perfect semi-precious stone for this wardrobe. Just make sure that you find some that has the golden warmth that’s characteristic of your caramel neutral. I would seriously wear two of those silver cuffs with the pearl cufflinks – how much fun is that? A little bit of turquoise in some gorgeous earrings is perfect for these outfits – especially the turquoise silk shirt! And a brooch on your cardigan – why not? Nobody else ever does! And sometimes, a simple dress, a pretty necklace, and eye-catching earrings are all you need to look perfect for the party! Links to all of the clothes and shoes (which may or may not work – they are old links) can be found HERE. Now you are speaking to my heart! I admit I plan my wardrobe and outfits around jewelry and how to set them off best. Since I am a goldsmith, I get the fun of making my own pieces to suit my own needs. Hi Janine, beautiful as always! I'm seriously lusting after those smoky quartz three drop earrings. Is there any chance you could add links for this article and similar (metallic bags and shoes for the starting from scratch wardrobe, etc.) to the Starting From Scratch tab at the top? It would be really helpful to be able to find these articles easily. Good morning. Ah yes, jewelry. I even wear my 1 inch gold hoops to the gym! I have a very old pair of glass drop earrings from my grandmother that make me feel festive and connected at the same time. I love brooches! I have several that belonged to my grandmother and wear them often. My son is getting married next year and instead of flowers I am wearing one of my grandmother's Eisenberg brooches, so is the mother of the bride, and my future daughter-in-law will carry a brooch bouquet! Have a great day! You're so right Janice, about jewellery making us feel special, so that we'll look special too, even if the jewellery is quite discreet. And yes, it is fun to shop in the little shops, markets, etsy, all kinds of off-beat places. Also, jewellery is wonderfully varied now, to suit all styles and tastes, and there are wonderful artisans making things. I like to travel light (hand-luggage only) so enjoy buying earrings as souvenirs of happy holidays. Then when I wear them later, I not only feel good in them but can remember that amazing week in Prague or Paris years before. And what a beautiful thought from Katie about wearing jewellery handed on from women you've loved. As so often, an inspirational post. Ooh, what luscious jewels you're including here! Really pretty and interesting bits and pieces! I love pretty much all of it, but those pearl cuff stick out as an amazing idea, and the 'drippy' gold brooch and so many lovely earrings! Earrings are my favourite type of jewellery. As long as they're not too big and heavy, they're the most comfortable. I do wear quite a few chunky short necklaces, but I don't find them that comfy. I go through phases with bracelets (generally only wear big ones in summer). At the moment I'm just wearing my mum's gold chain link bracelet all the time. I have gone through phases of wearing brooches on my winter coat, but my current coats don't really suit that. I don't generally wear them on cardigans etc. as I feel so prissy. Still, I do like them in themselves, so I should give it another go. Oh, baby! This post is right up my alley. If there is one accessory error I see grown women make, it is too-safe jewelry, the "all occasion" stuff really does not suit an occasion! I like a brooch on the shoulder (not lapel) of a jacket or sweater or on a shirt sleeve, instead of a bracelet. And may I put in a plug for real pearls? Prices for quality freshwater are very reasonable and they look infinitely better than fakes. OK, that silver and pearl cuff? Wow – wearable sculpture! I make my own glass beads and jewelry, and have a huge weakness for natural gemstones. Right now I'm on a turquoise kick. For my color palette it is probably the most versatile choice, as it goes with all of my purples, teals, and red-violets. And it looks lovely mixed with pearls and smoky quartz, too.